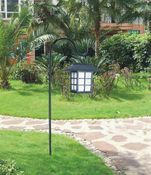 Elegant and simple our lamps add style to any walkway, yard or garden without having to figure out wiring. Requires no power source and can be installed anywhere. Solar panel collects natural sunlight and charges the internal rechargeable batteries during the day. As night falls these solar lighting products turn 'on' and brighten your garden or walkway. 12-Pack Ultra Bright LED Silk Effects Solar Lantern Square shape - This square solar lighting product, lantern, combines shimmering, sheer pearl silk fabric with dazzling earthy colors to illuminate your deck, patio or pool area. 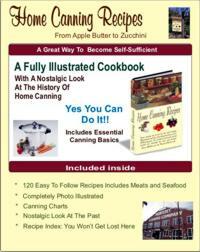 - Price $5.50 per unit when purchased in a pack of twelve! 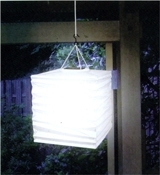 - Silk Effects Solar Lanterns lighten up your outdoor area by casting a radiant iridescent glow in the darkness. - The solar panel collects light during the day and charges the AA battery inside, ON/OFF Switch Transfer. - When night comes, the photo sensor automatically turns on the lantern without the hassle of plugging in power cords. - Square shapes and White Color. - For decorative purposes only. - Upper item size about 4"
- Lower item size about 2.5"
- Solar Panel Diameter 4"
- The lifetime of LED lamp is over 100,000 hrs. You never need to change it. 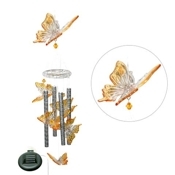 - Butterflies Wind Chimes Solar Color Changing Light is a green and environment-friendly products. The light is powered by solar energy through solar panel. The solar panel converts sunlight into electric energy and then charges built-in "AA" Ni-Cd rechargeable battery during the day. A light sensor turns on the light automatically at night. - The light shall be installed in a place where the best sunlight can be located and the surface of the solar panel shall be placed in the best direction in order to accept the maximum sunlight. The light source is super bright LED which can work up to 8 hrs at night after a full sunny day charging. - Hummingbird Wind Chimes Solar Color Changing Light is a green and environment-friendly product. The light is powered by solar energy through solar panel. The solar panel converts sunlight into electric energy and then charges built-in "AA" Ni-Cd rechargeable battery during the day. A light sensor turns on the light automatically at night. - Moon & Stars Wind Chimes Solar Color Changing Light is a green and environment-friendly products. The light is powered by solar energy through solar panel. The solar panel converts sunlight into electric energy and then charges built-in "AA" Ni-Cd rechargeable battery during the day. A light sensor turns on the light automatically at night. Multiple Amber LEDs provides a warm, inviting glow. Products size 12" 1/2X12" 1/2X39"
Green plastic floating ball solar light is the perfect addition to any pool or fountain. This light contains 1 LED bulb. Product size is 4.50" x 4.50" x 2.50"
Red plastic floating ball solar light is the perfect addition to any pool or fountain. This light contains 1 LED bulb. Product size is 4.50" x 4.50" x 2.50"